Posted by Arun Rajagopal in Advertising, Books, Conversations, Marketing, Social Media. 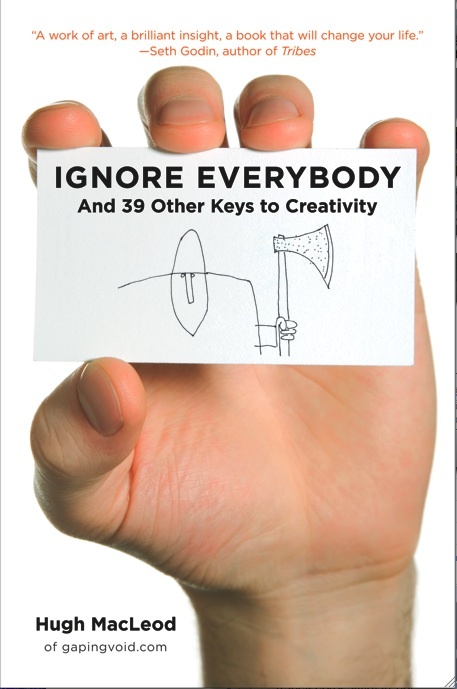 When you hold a book titled ‘Ignore Everybody And 39 Other Keys to Creativity’, you know you are in for something special. And if the author happens to be Hugh MacLeod, it’s time to dive straight in. But then there are always chances that you will ask ‘Hugh Who?’. Good ideas have lonely childhoods. And then it hits you that this is a unique book. Especially if creativity matters to you, irrespective of your profession. If making a difference is important to you. If you feel you are yet to fulfill your true potential, but want to get there. If you are waiting for that AHA moment in your life when you realize your true calling. ‘Ignore Everybody’ is for you. This book is based on Hugh’s life experiences in his inspiring journey from a struggling copywriter at Madison Avenue to a successful entrepreneur straddling the worlds of art and new media. Those in the creative arts will easily identify with Hugh’s thoughts and ideas; many of our pains, pangs, joys and jubilation are echoed in his words, which is why I would recommend this book to the creative tribe. I wish colleges gifted ‘Ignore Everybody’ to students because they can learn so much from this book and be better prepared for the curve ball that is life. I love the bit-sized chapters of the book. And most importantly, the amusing yet thought provoking biz card size cartoons that introduce and conclude each chapter of wisdom. There are cartoons on relationships that appear in between chapters that I found a bit jarring and out of place. But then I think Hugh is trying to make an important point – As we go about the business of changing the world, it is our relationship dynamics with ourselves, our good soul, our inner demons and those who matter to us that hold the key to how we get to bring about the change. There will be several points during the book when you will feel both Hugh and you talking in the same voice. That I think is the greatest compliment the author can get. Dear Hugh: Thank you for sharing ‘Ignore Everybody’ with the world. Thanks for this blog post… it spoke to me at a good time!! I am eager to get the book as just your words about it alone seem to be resonant and in sync with my own thoughts and journey!